A heavy duty, high specification open frame tape designed for the professional user. The impact resistant ABS frame has a handy integral ground spike, plus a tough, high impact polymer centre with low friction bearing, which offers a smooth rewind action. 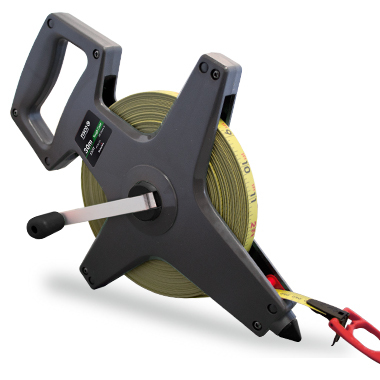 The Pacer is available with a selection of blades, ranging from 30m to 100m, in ‘Tough Coat’ nylon coated steel or ‘Matt Coat’ polyester coated steel, all of which are accurate to EC Class II. 13mm ‘Tough Coat’ nylon coated steel or ‘Matt Coat’ polyester coated steel, accurate to EC Class II. Impact resistant ABS frame with an integral ground spike. Tough, high impact polymer centre offers additional strength to the winding mechanism. Low friction bearing for smooth rewind. *PY30/5 available verified and stamped at extra cost.